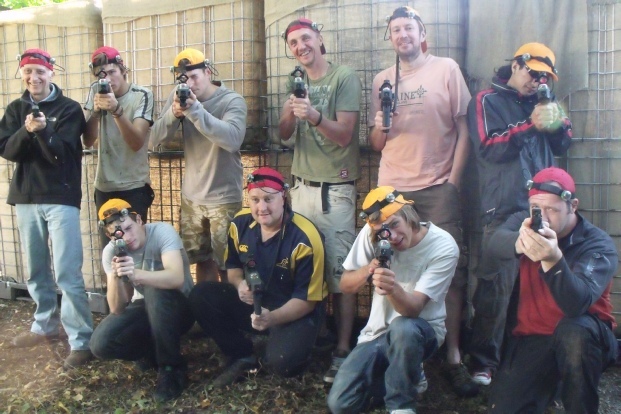 Whether it’s a student, family or school reunion, Wye Valley Warfare is a great way to get together, rediscover those special friendships and have stories that you’ll tell each other for years. It’s in Symonds Yat West, it’s highly competitive, it’s great fun, it’s a chance to get everyone working on some outrageous military fancy dress. One thing’s for sure - somebody’s gonna look silly dressed as a ghillie, and everybody’s gonna get slaughtered! LASER OPS games are like paintball, but without the pain or the paint, so you don’t need the balls! You get to play on our purpose built Battleground in Symonds Yat West. It’s design is inspired by the Close Quarter Battle ranges used to train the SAS, but it’s not hard-core military, it’s pure fun. A session last two hours during which you’ll play about 6 to 10 games, all with a Special Operations twist. You’ll need 10 players for an exclusive session, and our upper limit is 24 players. If you are bringing children, bear in mind that they must be 8 years old to play LASER OPS and non-players are not allowed on the Battleground. There are plenty of good pubs, camp sites, hotels and even castles where you can stay close by.